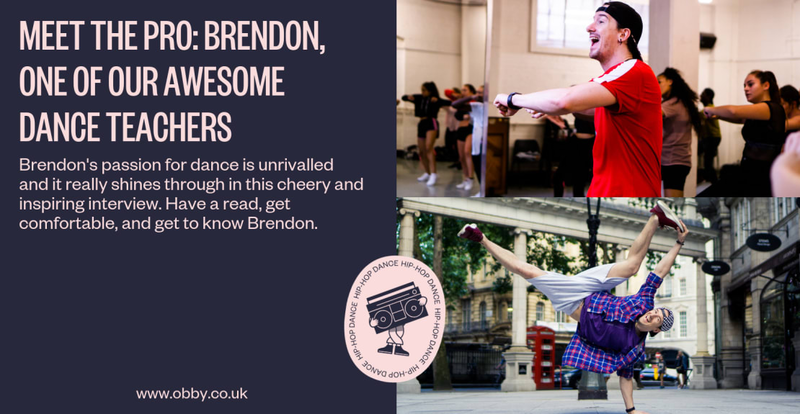 Shining with bags of personality and charm, Brendon teaches commercial dance classes with Obby at the infamous Pineapple studios. Read this interview to find out about his teaching career as well as get to know the man behind our very popular commercial dance classes. Brendon is known around the world for his energy and enthusiasm. In his classes, he drives his students with his passion both to inspire and educate. Find out more about his classes here, and read on to be charmed by this fantastic teacher! Tell us more about yourself. Who is Brendon and how did you get into dancing, and ultimately choreography? Well, I started dancing at 18 and committed full time to the career at 19. I was studying Fashion Design at the London College of Fashion and walked past pineapple one day and looked in the window and was really excited about what I was watching. From there I started to learn to dance but I was far from a natural dancer… It took me so long to master even the basics. However, I was determined to get better. Fast forward a couple of years of lots of practice and determination and I got awarded a place at the Laban centre, an amazing ballet and contemporary school. I was interested in street dance though, so I travelled around the world, learning from the greats. I had an amazing dance career, performing as much as possible with brands and artists. It was a few years into my dance career that I started teaching. I even owned and ran a dance studio for a few years called Alter Ego in London. When I hit 30 I was performing with a touring dance company and unfortunately, really hurt my shoulder which took me out of my career for about a year. After deciding my body couldn’t take the intense schedule of a professional dancer, I thought about choreography. Once healed the natural progression was to become a choreographer full time and this is where my career really began, I wish I had done it earlier as I couldn’t be happier! Do you consider yourself a choreographer or dancer and what’s the difference? I am 100% a choreographer. As a dancer, you get taught what to do and as a choreographer, you create and teach people what to do! Commercial dance is actually many different styles under the same umbrella term. In short: anything that is commercially viable can be considered commercial. However, the general consensus is that commercial is popular dancers forms you might see in music videos generally choreographed to popular chart music. What's a week like in the life of Brendon? A week with me can go from being as simple as teaching classes and my youth company all week to being non-stop 6 am starts on set as well as trying to teach as many of my classes as possible. The great thing about the quiet weeks is that it gives me time to work on my own projects and ideas. For example, I recently released a Film called Building A Dancer. Which I directed and starred in - (You must watch this if you want to dance!) available on iTunes, Amazon and Google Play. One of my most busy weeks recently was the week I got to work on Rick Astley's and Rod Stewart's music videos. It all starts with the casting, then the choreography and then the filming itself and getting to work with some absolutely incredible people. Rod Stewart? That's pretty cool - tell us more about that! Working with Rod Stewart was amazing for two reasons: First, off it was a full out dance video so I got to be really creative with my movement and secondly… it’s Rod Stewart! Rod was a really lovely guy and it was an absolute pleasure to meet him. How do you find swapping between teaching beginners in your classes, to coaching professional dancers at auditions at Pineapple? I absolutely love educating dancers no matter what level they are, its definitely a passion of mine. I do have a big soft spot for my beginner class because there is no pressure in that room what-so-ever and it's just so much fun to teach! That being said, I also love creating interesting and challenging choreography for the professional dancers and watching them go on to do amazing things. What makes your classes different from the rest? I suppose the main things is me, there is only one me ha ha! There are so many amazing teachers out there and they all have so much to offer. What I try to focus on is really getting to the foundation of movement and helping people understand how to move their body while also delivering new, in trend and up to date choreography. Finally, as a total novice, what#s your advice to me about getting into dancing for the first time ever! Could I take one of your classes? YES YES YES!!!! Come down to my beginner class every Saturday 2-3pm at Pineapple Dance Studios!!! You will have so much fun and, of course, learn to dance.